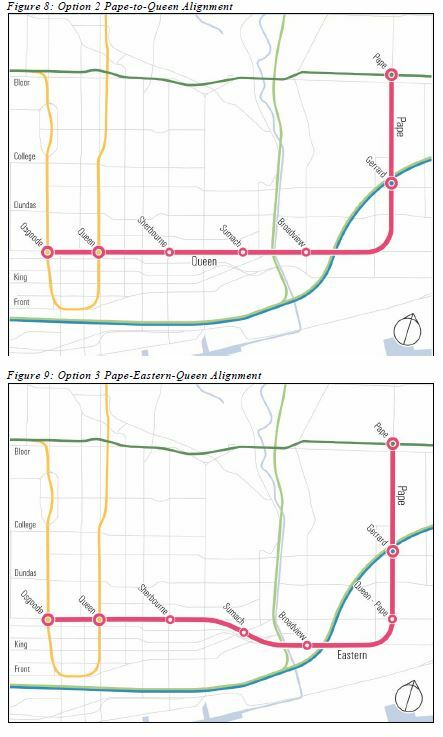 The two options have different effects at Bloor-Yonge with Option 2 ranking better because of the shorter travel time. This is yet another example of how a model focused on travel time could skew results. The difference in travel time is about 2.5 minutes, but avoiding the congested transfer and travel on the Yonge line has a value to riders. When the line is extended, this difference in running time will be even more trivial compared to the benefit of a trip to downtown that does not pass through Bloor-Yonge. The effects of SmartTrack and of Unilever development are not included even though they are major factors in network planning. Indeed, the very reason the Eastern Avenue option is favoured is to serve Unilever. Therefore, this chart and the one following (for the extended line in phase 2) misrepresent the potential of the Relief Line. One might wonder whether this is an attempt to downplay the line’s benefit. All day ridership is quite strong, and again this is without provision for the effect of ST or Unilever. Substantial peak congestion relief on the 501 Queen and 504 King streetcar corridors is projected based on 2031 modelling. However, it is unclear how much the travel time actually changes when the need to transfer between routes is taken into account. The King route is fairly close to downtown where the Relief Line night intercept it, and the transfer penalty could represent a substantial addition to trip time. In previous alignment evaluations, the proximity of stations to concentrations of low-income residences, such as Regent Park and Moss Park, contributed to the Queen alignment ranking more highly than Eastern. However, by the time of this round, other considerations come into play under the rubric of “social equity”. On the matter of supporting city growth, this evaluation again picks up more points for the effect of any new route on its surroundings that in previous studies. In summary, Option 2 is less effective in supporting growth as it provides only indirect service to the future employment growth planned for the Unilever lands. The proposed station at Queen-Broadview (compared to Eastern-Broadview) is not anticipated to support significant new employment in its immediate vicinity and may result in significant impact to the existing small-scale, mature retail environment during construction. Although Option 2 supports some development in the Queen-Broadview area, including Riverside Square development and existing higher density uses on Broadview south of Queen, the site is constrained in terms of the development that can be supported as a result of Queen Street East Heritage Conservation District. There is also limited ability to support growth at the West Don Lands. These issues were abundantly clear earlier in the evaluation process, and yet they appeared to be ignored. Was the “fix” in for an all-via-Queen alignment, only to have the focus shift to Eastern when the other benefits could not be ignored? We may have arrived at the correct decision the long way around, but this begs the question of what might have happened here (or on other alignment studies) without an “Aha!” moment among the planners. It is likely that the “Aha!” was triggered by Great Gulf, the developer of the Unilever site who may have been less than impressed by having their site served only by SmartTrack. Indeed, recent presentations by Great Gulf show their site as a major node served by multiple lines including the southerly extension of streetcar service from Broadview which would link to the Port Lands line on Commissioners Street. In the financial analysis, the presumed service level (used to calculate the fleet size) is 3 minutes peak, 4.5 minutes off peak. This is not the same as the service level of 2 minutes peak, 3 minutes off-peak cited in the Initial Business Case Options [Table 4 on pp 15-16]. Using the more frequent service, the Relief Line would require 11 4-car trains for service plus spares, and the study presumes that they would be stored at Greenwood Yard. This is not possible without the construction of a new subway yard, currently planned for property near Kipling Station. That is an added cost that will be triggered by various subway options including the RL and some service configurations of the extended BD/Scarborough subway. As mentioned earlier, the Metrolinx Benefits Case methodology is weighted to the regional effects such as reduced travel time and congestion. The Relief Line provides different benefits that are not “monetized” by the methodology including the value of network redundancy and the potential for avoidance of costs and heroic efforts to accommodate growth entirely on the existing subway network. Constructing the Relief Line will have a major effect on streets and neighbourhoods through which it will pass, notably at Pape and Danforth where the tunnel boring machine’s launch site would be somewhere north of Danforth. This is the tradeoff for a bored tunnel (as opposed to cut-and-cover over the route’s length). The tunnel will be deep enough that most of it is in bedrock unlike the TYSSE (Spadina extension) or Eglinton LRT project. 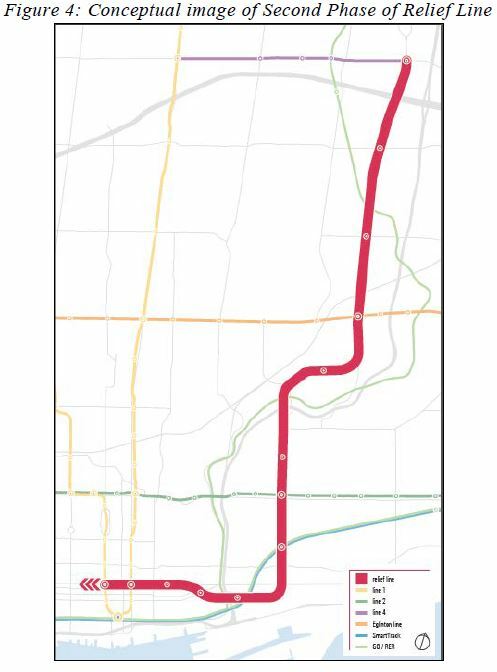 At Danforth, the Relief Line will pass under the existing Danforth Subway, but would have service track connections from the westbound Danforth rails to the new line in a manner somewhat like the connections between the Sheppard and Yonge subways. Queen’s Park has given Metrolinx $150 million to continue the planning and design work on the entire Relief Line, although initial work will focus on Phase 1 from Danforth to downtown. Among the definite requirements in the short term is a reconciliation of the inconsistencies in service levels and land use assumptions for the Relief Line demand and financial models. If anything, the RL should prove even more important than previously thought with the combined effect of (a) the limited level of SmartTrack service that will actually compete for riders, and (b) the inclusion of direct service to the Unilever site and the Great Gulf development planned there. The benefits of future extensions should also be better understood to blunt the bias against a “downtown” line. At the very least, the modelling should tell us the origin-destination patterns both for the Relief Line and for other riders whose trips will benefit from diverted demand on the Yonge-University subway. This would reveal who really will benefit from this project and, with luck, establish that this is far more than a pet project for a few downtown-living, latte sipping transit advocates. A Relief Line, or the Don Mills Subway as I prefer to think of it, is long, long overdue in Toronto. This is not just a railfan’s toy, a line sketched on a map because it looks nice, but a vital part of Toronto’s transit network looking forward to the mid-century. This entry was posted in Downtown Relief Line, Transit. Bookmark the permalink. If the N-S segment on Pape has to go south to Eastern (to access the Unilever site) why does the E-W segment then go along Queen? Why not a more southerly route into the downtown? It would save the costs of tunneling back up to Queen. Are there other constructions associated with such a route that are avoided if Queen is used? Steve: Apparently the geology of King is not as favourable as Queen, and so that’s why they jog back north. Every time I think we’ve reached peak-euphemism, I am newly disappointed. Steve: Yes, that’s a particularly loathsome term in this report. It would make far more sense to run along King than along Queen Street. 504 King is the busiest streetcar line in the city and there is a lot more development along King than along Queen. King is closer to major destinations like Exhibition Place and the SkyDome. Apparently the geology of King is not as favourable as Queen, and so that’s why they jog back north. The geology of an Eastern Avenue Don crossing was not as favourable as Queen either until it was! If I recall correctly when the decision was made earlier this year on the Queen Street alignment for the DRL, there was talk of a new station at City Hall/ Nathan Phillips Square. That idea always seemed absurd to me, but it appears now that it has been abandoned, is that correct? Steve: The updated maps show two stations to connect at Yonge and at University, but the project staff treat the whole thing as simply an illustration, and City Hall Station could reappear as a cost-saving measure. I think that politically it didn’t smell very good, and so was removed, for now. Why does the e/w line have to run on either Queen St. or King St.? Would not an alignment on Richmond, Adelaide, or Wellington make better sense? Less disruption, plus incremental additional transit by not pulling out the streetcar line. As well, the relief line is supposed to eventually proceed further west to around the Dundas West and Bloor area. A Queen route would be the most difficult, whereas Wellington or Adelaide can connect with Liberty Village and the GO/CPR/UPX right-of-way. Another consideration is the nature of the Queen West and Roncesvalles neighbourhoods, where the streetcar is an indispensable, integral part of the streetscape. Steve: Remember that Richmond and Adelaide both effectively end at Bathurst Street. Yes, Wellington would be an ideal alignment especially for future extension westward, but City Planning is in love with Queen, if only to avoid competing with the Mayor’s precious SmartTrack plan. The fix was in for that northern route months ago. As ever, this a great review of the staff report, highlighting the changes from earlier versions of the plan. I heartily agree that the ridership model is lacking both with respect to including the SSE ridership projections, and particularly to the over-emphasis it places on travel time. Surely people will take the Relief Line even if there is a minor time *penalty*–if only to avoid the crush at Bloor-Yonge and (increasingly) St. George or Spadina stations. I shared your assessment of Planning’s rationale at the February/March information sessions: It seemed there was a heavy emphasis on cost reductions and place-making at City Hall, with a lack of consideration for growth and development in the south of wards 28 and 30. It was under these auspices that I started on “Beyond Relief”. Suffice to say, I was pleased when the recommended alignment was presented to the public at the beginning of this month. At the same time, some of my neighbours on Pape were surprised and upset to see an unexpected (to them) red line on a map going up their street. Since then I’ve been trying to build bridges with them, and I re-conceived the Beyond Relief site to that goal. To provide a more comprehensive answer to Kevin Reidy and Andrew: Planning wed itself to Queen when they identified Pape-Queen as the “preferred corridor” back in February/March even though King corridors scored equally-well using the evaluation criteria at the time. When council approved that recommendation, staff were bound to Queen through the core. The preferred alignment which as emerged represents some of the best aspects of the King corridors (namely, Unilever), while retaining some of the rationale Planning gave to council for the Pape-Queen corridor. I’m not sure how much the public input during those sessions played in landing where we did–probably not much, but I’d like to think “some”–but it *feels* like the planning process mostly worked. Executive Committee yesterday was “interesting”. Pape residents got the consideration of Carlaw south of Gerrard they were looking for, but I fear they aren’t going to like the results of the analysis. There are two large sewer trunks (1.8m Sanitary, 1.8×2.5m Storm) which run underneath Carlaw Ave. When coupled with the additional curves, and the difficulties those may create with respect to an interchange station at Gerrard Square, the concept may prove unworkable and people will be even more upset than they are already. Thankfully, the recommendation is written in a way such that it shouldn’t significantly delay moving the project into TPAP–just another Executive Committee meeting for residents to berate both planning staff and the committee ahead of a council vote. While it’s understandable, my personal feeling is that Pape residents were entirely too concerned with the existing overground features of their street when they should have been campaigning to have any station in the neighbourhood mined–though I suppose there’s time enough for that too, a cause for which I’d be only too happy to help. Thanks again for all your efforts keeping us informed, Steve! Wait, where is it written that the streetcars would be removed from Queen? Steve: It would certainly be interrupted to allow for construction of the station at Sherbourne, and would divert around Yonge/Osgoode via King Street (not exactly ideal). I fully expect the anti-streetcar brigade to make an appearance in this process, and you can already smell feints in that direction with projections for very large drops in streetcar loadings on the 501 and 504, even though someone who is already on them has little incentive to change. It is likely that the “Aha!” was triggered by Great Gulf, the developer of the Unilever site who may have been less than impressed by having their site served only by SmartTrack. I don’t know about this. IIRC First Gulf also owns the new G&M Centre and has a few other properties to be developed along that stretch of King Street. If it were true you would think they’d be lobbying here for something a little closer. Hence the importance of eliminating the non-preferred corridors first. Perhaps the most important part of the process when all’s said and done. What does it take to convince them to just plan for and build the entire line to Sheppard at once??? Shovels won’t be in the ground for a decade so why not just build it all at once. Should they use cut and cover in some areas to speed up the process or just bore the entire length of the line? Why only 4-car sets??? If the line were to actually be built to Sheppard, I foresee the need for 6-car sets. Maybe a stub of the line (“phase 1” as we call it right now) could be tested using 4-car units but I am pretty sure that that line will become packed during AM/PM rush for sure. Steve: The fundamental problem is that there still isn’t widespread support for the “long” DRL, partly due to cost, and partly because the TTC did such a disgusting job of saying no DRL was needed at all for decades. Now they are pushing the link to Danforth giving the impression that going further north isn’t really important. Then there are the Councillors who are still trying to get billions more for their pet project in Scarborough. I pity Scarborough’s transit mess, but loathe the blatant dishonesty of their self-serving politicians.